The Onion is pointing out a grand opportunity for aviators and would be aviators. It seems like the lists of allies who signed up to fight the Iraq War seems to change from time to time.Â Yes, the two tenses in that sentence might alarm you.Â The New York Times notices these things. Once every two years (24 calendar months, really, but who’s counting…) the FAA requires private pilots to spend a couple hours with an instructor or other authority to make sure that their skills and knowledge are up to the standards required to share the national airspace. My 24 months are up this month, so I spent some time yesterday with my instructor. 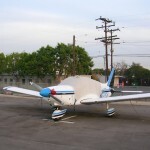 A flight review isn’t required to be as rigorous as a checkride. Because my regular instructor, Andy, and I fly together fairly regularly, he’s got a pretty good idea how well I’m keeping my skills honed. 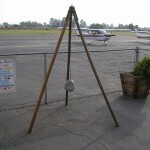 This created a more relaxed atmosphere than a checkride. If I were dangerously out of practice or exhibiting questionable behavior, I’d expect Andy to let me know whether it was flight review day or not. Similarly, he challenges me when we’re flying together. Most of the air time was spent on things I don’t do very often. We did some performance take-offs and landings as well as a couple engine-out landings. The performance stuff went pretty well, but one of my engine-out landings was much closer to blowing the energy budget than I would like. It was a good to see just how much energy a sharp turn burns, as well as how it looks to do one down low. I definitely take the point about being smoother with my set-up/approach and not putting myself in a spot where I need a big correction down low. We did all these at an unfamiliar airport, which made for better training. At Santa Monica, I know enough landmarks to cheat; at El Monte I don’t – especially with the wind favoring the less common direction. We did some other VFR airwork, polished up some stall recoveries, and some steep turns. I got to do a little slow flight as well. I like slow flight, and work it myself fairly regularly, but it was good to let Andy have a look at it. We did a couple unusual attitude recoveries as well, including a very impressive steeply descending scenario. 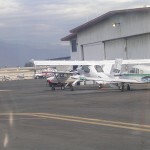 After that we spent some time reviewing the aviation regulations over the Airport Super Breakfast at Annia’s at El Monte. This was literally more than I could eat for less than 7 bucks; an awesome choice. The ground school review was helpful, but I’ve come away with some questions about some of the new GPS/GNSS airways that are sort of a homework assignment. 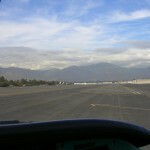 I took a couple pictures as I pulled out of El Monte, including a PZL-104MA Wilga 2000. I didn’t know what it was at the time, but the FAA registration database is really helpful. You can sort of tell what it is from my picture, if you know what it is. The actual aircraft is very striking. I also took a shot of the clouds over the mountains at El Monte and of the comparatively low price on the self-serve fuel sign at SMO. This fellow seems to be trying to apply Godwin’s Law to the whole bacon-is-awesome meme. No, I don’t have a separate category for bacon posts.Â Should I? Link courtesy of the inimitable Sam Pottle. I found a little time today to go out to Flabob airport and see how the basin was doing. It looks a little burned, and there’s still a lot of smoke/haze hanging around. There were lots of people up and around, though. It was busy on most frequencies today – especially Santa Monica ground for some reason. 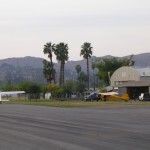 Flabob itself remains a classic small airport. There were several people coming and going. A tailwheel pilot stopped by the EAA hangar, apparently to see what was going on; there was a Mooney practicing take-offs and landings; a newish looking LSA was on the ramp and departed while I was there; there were a couple other transients floating around. I stopped in to the cafe for a patty melt and watched the world go by. I took a couple pictures, below. One is the Flabob weather rock, which I had reported as INOP in 2006. It’s been functioning for a while, and I’m happy to have photographic evidence. The last two are at Santa Monica, and are interesting not for what’s in them (though my plane is always cool to see), but for the tree that isn’t in them. 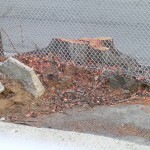 Apparently they’ve cut down the tree that hung over my parking spot and shed seed pods and bird droppings on it. This is good. Good day all around, really. Will Eisner’s The Spirit #22, Aragones, Evanier, Hardin, Faucher. The creative team is finally starting to grow on me. If anything the plot was a little too needlessly intricate, but overall a good Spirit yarn that moved right along. A nice issue. Captain America #43, Brubaker, Ross, Laguna, D’Armata. A new arc begins, and things seem a little posed. Presumably that’s to let new readers climb on here, and it seems like a good place to do so. Ross’s pencils seem a little stiffer than Epting’s, which underscores the stiff nature of the story. Still, no issue with Batroc the Leaper in it can be all bad. A good place to hop on a fun title. Madame Xanadu #5, Wagner, Hadley, Friend. The art’s still gorgeous and integrated tightly to the story. However, I’m finding myself less and less interested in the story as we go. I suspect that Wagner’s laying groundwork he’s going to need later, but each arc feels the same. We check in to a historical period, the Stranger shows up, something bad happens that Madame Xanadu plays a role in, some DC Universe connections are made, and then we’re off to the next period. Unfortunately this leaves us little room for a supporting cast. Worse yet, I find the relationship between the two leads difficult to fathom. Wagner makes it clear that Nimue is intelligent and well versed in the occult, but she’s both obsessed by and unable to find out anything about one of the most powerful beings in the magical DC Universe. It doesn’t seem consistent somehow. Hopefully either I’ll figure out what I’m missing, or things will improve. It’s still gorgeous. Sandman: The Dream Hunters #1, Gaiman and Russell. I have the version of this that Gaiman and Amano did a few years ago. The story is great, but I know it. I’m primarily buying this to see how Russell interprets the goings on. It’s beautiful and interesting to see how Russell attacks the same problems Amano did. Secret Six #3, Simone, Scott, Hazelwood. Great fun. There’s nothing particularly deep about Secret Six, but it’s consistently entertaining. The characters are all lively and fun, and the action is completely over the top. And behind the fun is the understanding that these folks are not the good guys, whatever decency they may occasionally show. Anything can happen to a villian, and these folks are playing way out of their league. It’s tough not to admire their pinache as they do it, though. 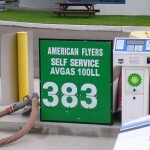 A pilot’s eye trip report for our 2008 trip to Portland is up. Other trip reports are also available. Sinfest this Sunday cast Obama very nicely for comics geeks. I finally wrote up a trip report for our holiday trip last year. 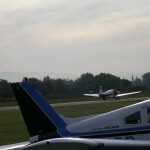 Enjoy the pilot-geeky description and the pictures.Â If you’ve missed any, the other trip reports are still available. 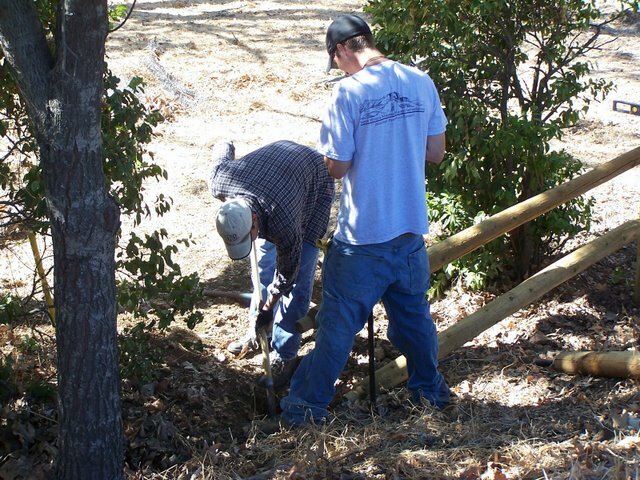 I’ve been meaning to post this picture of me helping put up a fence on National Public Lands Day earlier this year.Â I’m the one bent over. 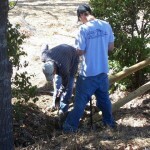 You are currently browsing the Walking on the Moon weblog archives for November, 2008.